Anark Corporation, a leading provider of technical enterprise content management (ECM) and visual collaboration software, and :em engineering methods AG (:em AG), leading provider of PLM technologies, has announced that :em AG is now a strategic reseller, implementation, and support partner for Anark products in Germany, Austria and Switzerland, and an Anark Marketing Agent for all of Europe. This strategic partnership brings together: em AG’s deep expertise and industry leading track record of successful, PLM driven digital transformation deployment, with Anark’s best in class technical ECM, Model Based Enterprise (MBE) and visual collaboration software platform. Together, Anark and :em AG will enable EU based global manufacturers to connect the Digital Thread, empowering more effective and secure communication and collaboration throughout engineering, supply-chain, manufacturing and field service operations based on data continuity. The Anark ECM platform enables OEMs and their suppliers to transform, publish and manage critical engineering, manufacturing and operational data into role-specific 3D PDF documents and HTML5 web content to empower connected, information-rich data exchange and collaboration on virtually any desktop, mobile, or wearable device along the Digital Thread. Anark’s solutions also provide the most advanced and complete support for powerful, standards-based MBE processes, which enable manufacturers to come to market faster, with higher quality products, at substantially reduced costs. AS9102 and PPAP quality processes are artifact intensive, creating a substantial burden for OEMs and suppliers to maintain compliance as well as applying the broad spectrum of system, assembly, and part-level requirements in production. Current solutions for quality process are often driven through a combination of inflexible applications that are incapable of managing detailed manufacturing requirements, and manually authored documents that are detailed, but are too often out of synch with design data. With Anark Core, quality teams can publish fit-for-purpose, template-driven HTML5 web content or PDF documents that provide solutions for use cases such as design FMEA, FAI with 3D MBD or 2D drawings, and more. With Anark MBEWeb, quality-process web content can be made available across the extended enterprise, allowing OEMs to present customized web forms for suppliers featuring engineering design and requirements data, with the ability to collect compliance information directly from the supplier. 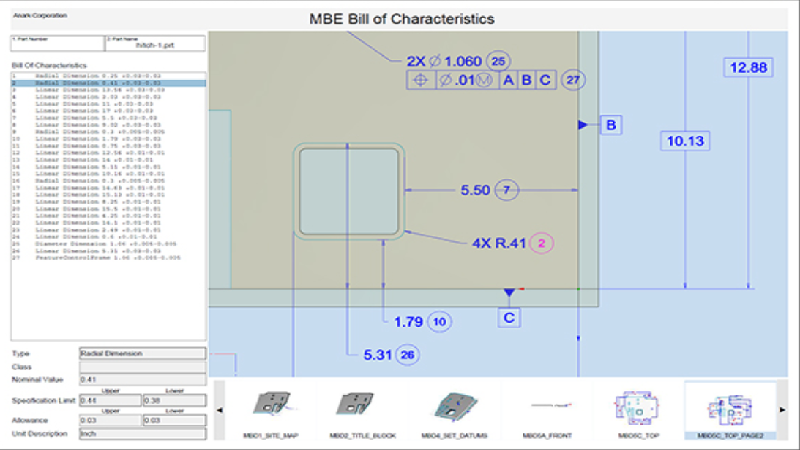 Companies that are pursuing an MBE strategy can combine 3D MBD together with bill of characteristics information in interactive inspection content, integrated directly into MES/production.